I had a bad habit of wearing my regular shoes and non-riding boots on the bike. This has resulted in melted soles, split toes, and more wear and tear than the shoe manufactures anticipated. I thought I was saving money by not investing in a riding boot, but instead I had to buy more shoes more frequently. It was not a money-saving plan. Now, if you're pinching those elusive pennies, River Road's Highway boots are one way to save on riding wear. The rubber soles are thick with a deep tread. 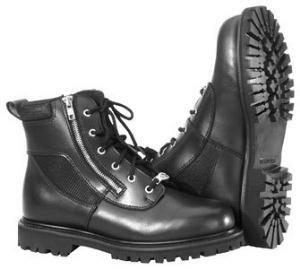 They are oil-resistant, and the sole can be replaced if you wear it out before the rest of the boot. The Goodyear welt construction lends durability to the Highway boot, and the padded insoles add all-day comfort. These are breathable to prevent swampy feet on long rides, and a tempered steel shank will help these boots maintain their shape over time and in a crash. I have mixed feelings about the zipper sides. The side-zip style does make them very easy and fast to put on and take off, but then why on earth are there laces? All the lace system does is make a place where water and rain can enter your boots. I would also worry about zipper failure, but in this case the zipper seems sound, and the 1-year warranty eases the mind. For highway riding, this boot will do what you need it to for $80 or $90. That's far cheaper than most riding boots, and you won't be going through shoe after shoe. If you don't want to change footwear, these will wear just fine off the bike.